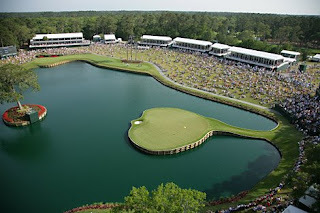 This weekend is The Players' Championship, what many call "the 5th major" on the PGA Tour. It's truly one of the toughest tests in golf. It's got maybe the world's most famous hole, the island green on 17, but the finishing hole is actually much more treacherous. No. 18 is a 462-yard par-4 shaped like a boomerang (but that doesn't favor the Aussies - just ask Adam Scott about that) with water all along the fairway and green on the left-hand side. Couple that with the fun and frolic on 17 and you have one of the great finishing stretches in sports. Every year, the field is just as strong as any major. And the dominant figures in the sport each become just another "player." Just ask Tiger Woods, who's only won the event once in 11 starts (2001 - which was also his last Top Ten). Tiger's last three finishes: T-53, T-22, T-37. And he didn't enter last year as he was rehabbing his knee for his epic US Open triumph. Just ask Phil Mickelson, who also has only won it once (2007). The same number of times as Craig Perks and Fred Funk, who each won with both Tiger and Phil in the field. And once fewer than Davis Love and Steve Elkington. It's also a great stage for tour winners to take that next step before becoming the dreaded "best player not to win a major" like Adam Scott, Stephen Ames, and Sergio Garcia (defending) have in recent years. My pick will follow that logic. I'm going with the swaggering 23 year-old Ryder Cupper, Anthony Kim. Besides winning twice in '08, he set a Masters record with 11 birdies in his 2nd Round at Augusta this year. He's got all the shots, and it's been a great year for Oklahoma Sooners' individual accomplishments (Sam Bradford, Blake Griffin). Let's add Kim to the list. Also, he's not short on self -confidence. Check out the customized "AK" belt buckle. Your most unconventional NBA Finalist?